This past weekend we joined the Bruce’s, Remme’s and Hausman’s at St. John’s church to make a bunch of Lefse. A few years ago I bought the Lefse kit ( Electric Lefse Griddle, Pastry Board and Corrugated Rolling Pin) so we could make it at home during the holidays. Making Lefse was a tradition that was celebrated by Pedar’s Grandmother, Dagny. What is lefse? Lefse is a traditional soft Norwegian flatbread. It is made with riced or instant potatoes, flour, butter, and milk or cream. It is cooked on a large, flat griddle. Special tools are used to prepare lefse, including long wooden turning sticks and special rolling pins with deep grooves. Erik and I wanted to finish the entire batch before church — so we did! When we got to St. John’s we continued to roll and bake lefse. Erik watched Mor Mor and Dawn make krumkake. 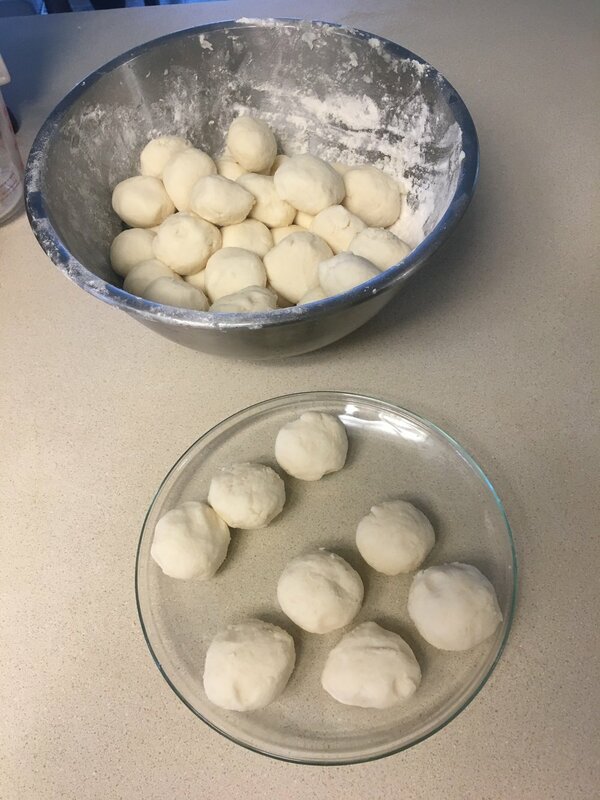 Roll out dough balls till nice and thin. Add flour until they don’t feel wet. Put them on griddle and brown each side. Serve with butter and cinnamon sugar or Nutella! Yummy!